Tips for World of Warcraft plus Reviews, Guides, Sutff about Classes, Races, Raids, Tradeskills, and more. TeamiDemise is a professional Counterstrike gaming group. They've earned plenty of cash by killing many opponents in Counterstrike and now they've come over to WoW, as a team. Imaging these guys in WoW PvP... Talk about a brutal premade. They've also written a leveling guide that's pretty cool. 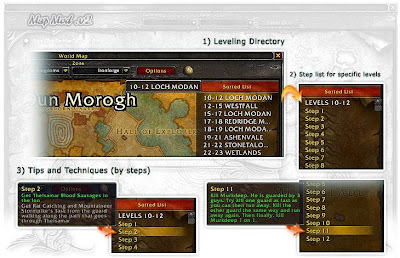 Like Joana's Guide and Brian's Guide it uses the Map Notes addon to allow one to quickly locate each and every quest in the guide. So what's cool about the iDemise guide? The entire guide is in-game. They've taken the map notes system and written it up as Step 1, Step 2, etc... You enter a zone appropriate for your level, click step 1, set a waypoint, and off you go. Then hit step 2, which just happens to be nearby, and so on... Also included, with the notes and waypoints, are quest tips, lots of "do this, here" notes, and professional gameplay tips. This image is a partial screenshot of their Ironforge map. Note the steps, which areas to go to for which levels, and the tips provided with the steps. No more alt-tab switching to the PDF guide, now you can go from 1-70 without leaving the game. Our resident expert, who's been playing since beta, and who's played enough of all aspects of the game to be seriously burnt out, says the iDemise guide made the game fun again. Pretty high praise. One more thing is that Brian and Joana's guide focus on the Hunter, well known for its solo leveling speed, and the iDemise guide doesn't. Play whatever character you like, the iDemise guide will get you leveled fast. Now, if you're the type of player who likes to print out pages from a guide, put them onto a clipboard, and check them off as you do them (which I did with Joana's Guide) then you'll have to get past that or this isn't the guide for you. There's also one big minus from the point of view of the newer player. The iDemise guide assumes you already know your way around the world. Now I can get around fine on the Horde side, since that's where I've been running through Joana's guide, but alliance side was new. My wife and I rolled Night Elves, ran through the iDemise guide to the point where we'd done all the quests, and then it tells us to go to Dun Morog. We finally found out, once our expert stopped laughing, and made our way to Loch Modan, Ironforge, Stormwind, and eventually to West Fall. Where a level 37 Hunter invited us into his guild and then ran us through most of the Van Cleef instance (up the the ship.) Ok, it wa a little outside the guide (heh) but we got some nice greens, useful blues, and gained a level. So in my view those are the two hits against the guide - the little one that you can't put it on a clipboard (and no links to thottbot, etc.) and the bigger one (for some of us) that there's nothing that tells you how to get from area A to area B, whereas Brian's Guide has pictures and Joana's Guide has pictures and videos. Follow us by Email and get all of our posts! Buying gold is against Blizz's rules, so what do you think they'll do if they catch you? Want to make large amounts of gold with zero risk to your accout? Make up to 4,000g Per Hour, maybe more, on Autopilot. Tycoon is the first gold addon and it makes you gold up to 500% faster!